How do I feel about Luis Castillo taking over for Jose Reyes in the leadoff spot? Jerry Manuel made some minor waves this weekend when he stated in a media session that he'll be experimenting this spring with having Luis Castillo bat leadoff and having Jose Reyes bad second or third. Now, some may say Jerry's just trying to shake things up during the spring, and has no real intentions of Castillo in teh leadoff spot as a long term solution, but I ask, why not? It makes perfect sense to me! Luis "Slappy" Castillo has no power. None, zippo. The dude had 11 extra base hits in 2008. Eleven. One more time: In 298 at bats his bat took him past first base eleven times. Castillo has just one tool left as a hitter: patience. 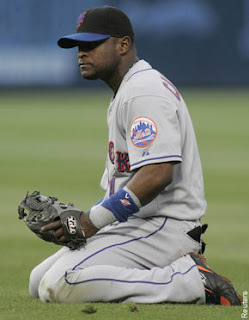 His on base percentage was .355 last year, within three points of Jose Reyes. And while of course Luis doesn't have the base stealling prowess of Reyes, Castillo doesn't clog up the basepaths. He swiped 17 bases last year and knows how to go first to third. Now, don't get me wrong, I would love to see Castillo shipped out of here and Orlando Hudson brought in, butif we are stuck with this guy, we might as well find a use for him. And having a no-power guy batting in RBI situations just doesn't make sense. And listen, even if you're not sold on this thought, just the idea that the Mets are talking about Castillo as a leadoff hitter can only cause other GMs to start thinking about him as a leadoff hitter. And that can only make him more marketable (tradeable) .